This successful textbook has been re-editioned to support the 2009 OCR GCSE Religious Studies B specification. It can be used to deliver the short course for OCR GCSE RS B in philosophy. It delivers the course through Christianity only, and therefore provides an in depth look at the issues in question. The book has a range of activities to engage the students; from key questions, discussion points, research tasks, extension activities to exam questions. Personal accounts of beliefs and experiences intersperse the main text to allow students to relate to the material they are reading. Each unit is summarised in the form of revision 'cards' to give students a 'snapshot look' at what they have just learned and need to learn for the exam. 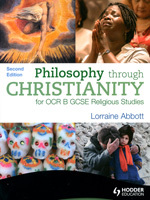 This book can be combined with Ethics through Christianity for OCR B GCSE Religious Studies: Second Edition to provide support for the full course. Written to deliver a Short Course in Ethics for OCR GCSE Religious Studies B. Combines with Ethics through Christianity to deliver the full course. Includes personal views on issues. Includes topical issues to stimulate discussion. Includes revision 'cards' at the end of each unit. Full of great ideas to make lessons engaging and motivating.